A 4-Drug Combination (Viekira Pak) for Hepatitis C | The Medical Letter, Inc. The FDA has approved Viekira Pak (Abbvie), a fixed-dose combination of two new direct-acting antiviral agents (ombitasvir, paritaprevir) with the pharmacologic enhancer ritonavir in one tablet, co-packaged with a third new direct-acting antiviral agent (dasabuvir) in a second tablet, for oral treatment of chronic hepatitis C virus (HCV) genotype 1 infection. Genotype 1 is responsible for 70-80% of HCV infections in the US. Viekira Pak is the second all-oral, interferon-free, fixed-dose combination for treatment of chronic HCV genotype 1 infection to be approved in the US; it will compete with the fixed-dose combination of sofosbuvir and ledipasvir (Harvoni) for inclusion in the formularies of third-party payers. Neither Harvoni nor Viekira Pak is approved for treatment of infections caused by HCV genotypes 2-6. MECHANISM OF ACTION — Each of the three direct-acting antiviral drugs in Viekira Pak inhibits an HCV protein that is essential for viral replication. Ombitasvir, like ledipasvir, inhibits the HCV NS5A protein. Dasabuvir is a non-nucleoside inhibitor of the HCV NS5B RNA-dependent RNA polymerase, the same enzyme that sofosbuvir inhibits. Paritaprevir, like telaprevir (Incivek), boceprevir (Victrelis), and simeprevir,4,5 inhibits the HCV NS3/4A protease. Ritonavir, a CYP3A4 inhibitor, is included in the regimen to increase exposure to paritaprevir, a CYP3A4 substrate. ADVERSE EFFECTS — The most common adverse effects observed in patients taking Viekira Pak and ribavirin have been fatigue, nausea, pruritus, skin reactions, insomnia, and asthenia. Without ribavirin, adverse effects occur less frequently, but still include nausea, pruritus, and insomnia. Serum alanine aminotransferase (ALT) elevations occurred in 1-4% of patients taking Viekira Pak in clinical trials and sometimes required early discontinuation; the labeling for Viekira Pak recommends ALT monitoring for the first 4 weeks of treatment. The rate of permanent discontinuation due to adverse effects with Viekira Pak was <1%, both with and without ribavirin. PREGNANCY — Viekira Pak is classified as category B (no evidence of harm in animals; no adequate studies in women) for use during pregnancy, but ribavirin is embryotoxic and teratogenic, and is contraindicated for use in pregnant women (category X) and in men whose female partners are pregnant. Ritonavir is included in Viekira Pak because it is a strong CYP3A4 inhibitor. Drugs that are highly dependent on CYP3A4 for metabolism and may cause serious toxicity at elevated concentrations, including alfuzosin, sildenafil (when used for treatment of pulmonary arterial hypertension), ergot alkaloids, lovastatin, simvastatin, pimozide, triazolam, and midazolam, are contraindicated for use with Viekira Pak. Use of inhaled fluticasone or salmeterol (both CYP3A4 substrates) with Viekira Pak is not recommended. Dosage reductions of cyclosporine and tacrolimus are required. Ombitasvir, paritaprevir, and dasabuvir inhibit UGT1A1. Paritaprevir inhibits the drug transporters OATP1B1/1B3, which may lead to an increase in indirect bilirubin. Paritaprevir, ritonavir, and dasabuvir inhibit breast cancer resistance protein (BCRP). Drug interaction studies have found that Viekira Pak increases exposure to ketoconazole, rosuvastatin, pravastatin, furosemide, amlodipine, alprazolam, and buprenorphine, and decreases exposure to omeprazole and voriconazole. Serum concentrations of some antiarrhythmic drugs, such as amiodarone and flecainide, may increase. Coadministration of Viekira Pak with voriconazole, rilpivirine, or ritonavir-boosted darunavir or lopinavir is not recommended; atazanavir 300 mg (without ritonavir) may be used if taken in the morning. Use of Viekira Pak with drugs containing ethinyl estradiol (such as oral or intravaginal contraceptives) or with efavirenz was associated with a high risk of liver enzyme elevations and is contraindicated (ethinyl estradiol is also contraindicated for 2 weeks after stopping antiviral therapy). DOSAGE AND ADMINISTRATION — Viekira Pak includes 250-mg dasabuvir tablets and fixed-dose tablets containing 12.5 mg of ombitasvir, 75 mg of paritaprevir, and 50 mg of ritonavir. Two combination tablets should be taken each morning, and one dasabuvir tablet should be taken each morning and evening. Morning and evening doses should both be taken with a meal. For patients without cirrhosis, the duration of treatment is 12 weeks. 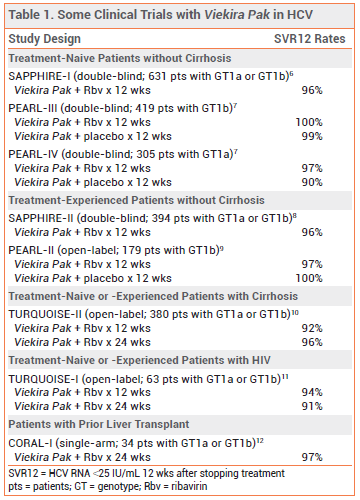 Patients with cirrhosis and genotype 1a infection should take Viekira Pak for 24 weeks, but 12 weeks could be considered for some of these patients as well; in clinical trials, 12 weeks of treatment was highly effective in this population, except for prior null responders to peginterferon and ribavirin. Patients with genotype 1a infection or cirrhosis should also receive ribavirin 1000 mg/day (or 1200 mg/day if weighing >75 kg). Viekira Pak is not recommended for patients who have a history of treatment failure with an HCV protease inhibitor (telaprevir, boceprevir, simeprevir). CONCLUSION — The fixed-dose combination of ombitasvir/paritaprevir/ritonavir plus dasabuvir (Viekira Pak) taken orally with or without ribavirin for 12 or 24 weeks appears to be similar in efficacy to the fixed-dose combination of ledipasvir and sofosbuvir (Harvoni), which does not require addition of ribavirin, for treatment of chronic hepatitis C genotype 1 infection. Use of Viekira Pak requires taking more tablets per day and has a greater potential for causing adverse drug interactions. E Lawitz et al. Simeprevir plus sofosbuvir, with or without ribavirin, to treat chronic infection with hepatitis C virus genotype 1 in non-responders to pegylated interferon and ribavirin and treatment-naive patients: the COSMOS randomised study. Lancet 2014; 384:1756. American Association for the Study of Liver Diseases/Infectious Disease Society of America/International Antiviral Society–USA. Recommendations for testing, managing, and treating hepatitis C. December 19, 2014. Available at www.hcvguidelines.org. Accessed January 22, 2015. Telaprevir (Incivek) and boceprevir (Victrelis) for chronic hepatitis C. Med Lett Drugs Ther 2011; 53:57. Simeprevir (Olysio) for chronic hepatitis C. Med Lett Drugs Ther 2014; 56:1. JJ Feld et al. Treatment of HCV with ABT-450/r-ombitasvir and dasabuvir with ribavirin. N Engl J Med 2014; 370:1594. P Ferenci et al. ABT-450/r-ombitasvir and dasabuvir with or without ribavirin for HCV. N Engl J Med 2014; 370:1983. S Zeuzem et al. Retreatment of HCV with ABT-450/r-ombitasvir and dasabuvir with ribavirin. N Engl J Med 2014; 370:1604. P Andreone et al. ABT-450, ritonavir, ombitasvir, and dasabuvir achieves 97% and 100% sustained virologic response with or without ribavirin in treatment-experienced patients with HCV genotype 1b infection. Gastroenterology 2014; 147:359. F Poordad et al. ABT-450/r-ombitasvir and dasabuvir with ribavirin for hepatitis C with cirrhosis. N Engl J Med 2014; 370:1973. D Wyles et al. TURQUOISE-I: 94% SVR12 in HCV/HIV-1 co-infected patients treated with ABT-450/r/ombitasvir and dasabuvir and ribavirin. Presented at 65th annual meeting of the American Association for the Study of Liver Diseases, Boston, MA November 7-11, 2014. Available at www.natap.org. PY Kwo et al. An interferon-free antiviral regimen for HCV after liver transplantation. N Engl J Med 2014; 371:2375.